How Crowd Companies, a council for large brands that we founded, which has experienced over 100% growth, see Crowd Companies. Below is the predictions slide, which calls out an area for discussion across the whole movement. In particular, read Lisa Gansky’s piece on Fast Company on how the startups should start sharing the value with the people that are making them popular. 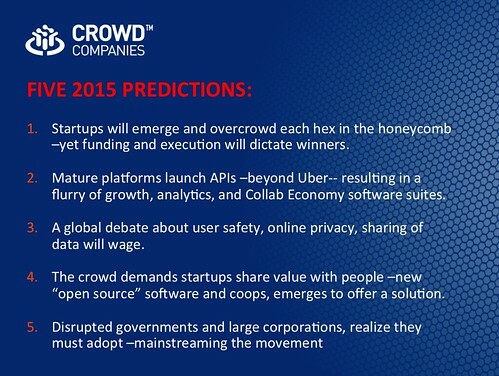 I’d love to hear your thoughts on what the future spells for the Collaborative Economy in this coming year. Over the years, I have watched author, speaker, advisor and host Andrew Keen’s position on the social web, he continues to challenge the status quo of the crowd, bringing balance. Andrew serves a very important role in the industry by curbing the exuberance of social by thinking about the short term and long term ramifications to business, society, and personal lives, in fact, his next book Digital Vertigo is out, discussing the topic of how today’s online social revolution is dividing, diminishing, and disorienting us. What’s the next phase of the internet and social web? What are the up and downsides? The battle between Google vs Facebook, who’s got the upper hand, and why? Why is it like 1:40am on the dance floor and software players are selling vs IPO? Andrew invited me to join him in the hip Techcrunch studios in SOMA SF, to discuss the future of the Internet and social. We discussed the industry at large, and how I think the next phase of social is data driven, performance based, and to some degree …automated. Join us in this short 15 minute video clip of rapid fire questions and my semi-coherant answers, in this fireside interview with Andrew Keen. I look forward to your comments below. Why is Google launching so many hardware devices like Nexus tablets, the Q (Home media) laptops, desktops, phones, and even augmented reality glasses? They want to be ‘connective tissue’ across all digital experiences, harness the data, make it useful to you, then figure out how to monetize it, primarily with ads. To summarize, their mission is to organize the world’s information, and sell it back to us, and there’s nothing wrong with that, as long as you understand this contract up front. I had the pleasure of joining This Week in Google show with Leo Laporte (Wikipedia), Gina Trapani (Wikipedia), and Jeff Jarvis (Wikipedia) for the second time, and we discussed Google’s new strategy, what it means, and how web technologies continues to change as it impacts consumers, brands, and the industry. Unlike short ‘broad-cast’ media clips, this is a long form, deep ‘narrow-cast’, that explores a number of related news topics and insights, so grab some coffee, get a comfortable chair, and settle in for this show on This Week on Google. The video is embedded below, or you can find it on the This Week in Tech website.